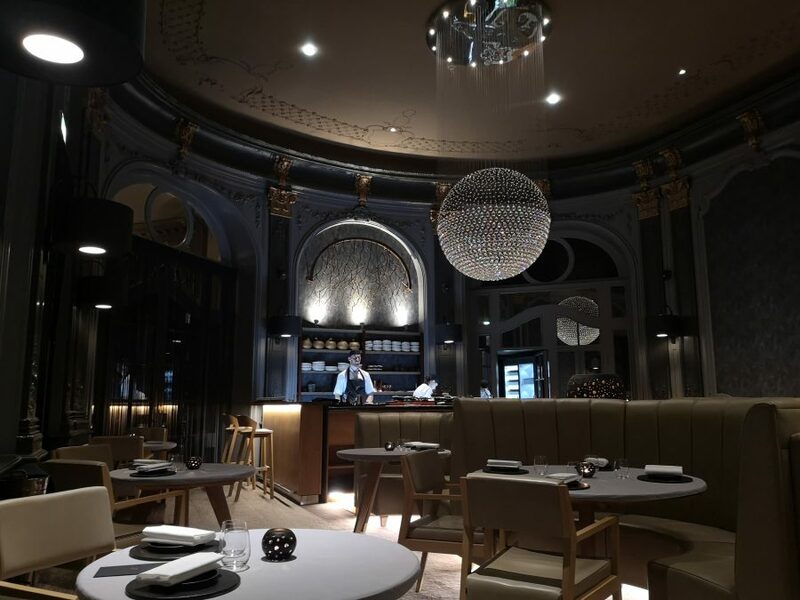 You’ll find Adam Reid at The French here now where it’s all multi course menus served in a fancy dining room. 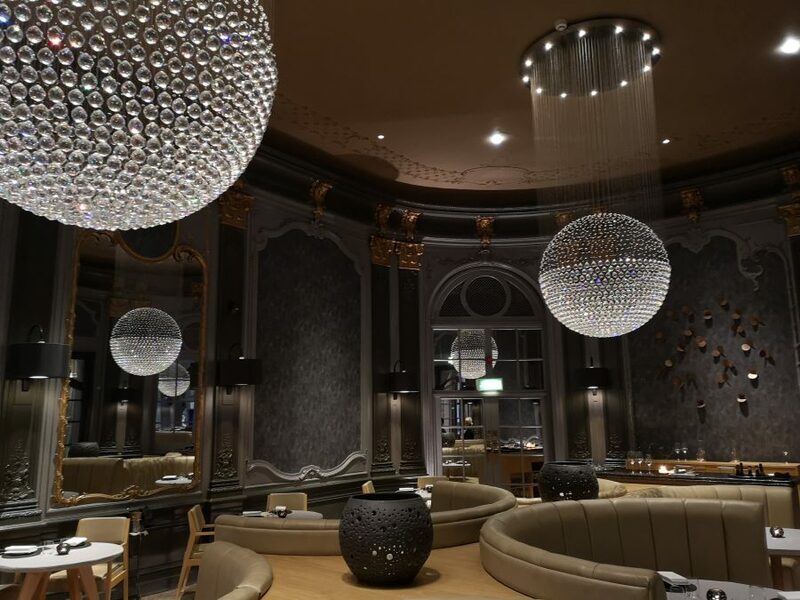 Two giant spherical crystal chandeliers are a glamorous focal point but it ain’t posh or stuffy, helped by a jolly and relaxed front of house team. 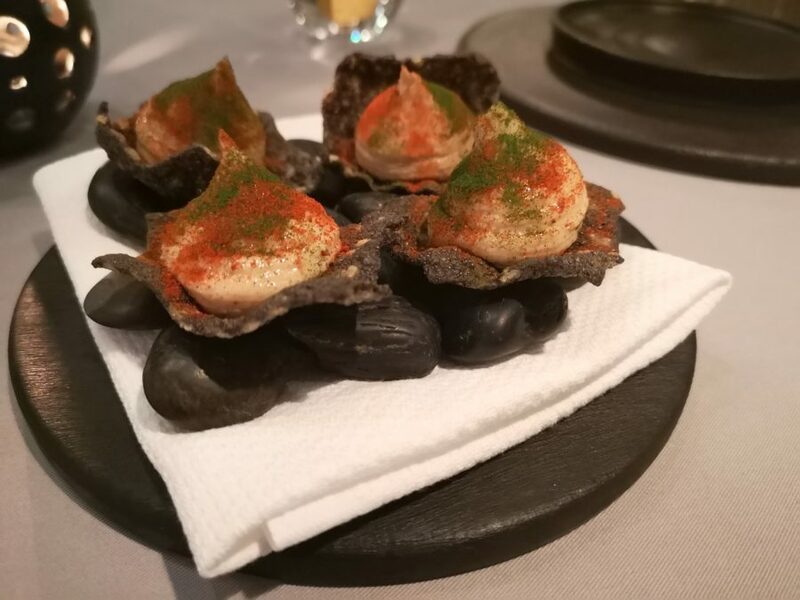 We start with snacks; cod’s roe on squid ink crackers and ‘tea and toast’ which sees a cup of vegetable tea, with a full on umami whallop, accompanied by a sliced of dripping toast topped with tongue. It could do with a touch of salt but the flavour is still exquisite. The Best Thing I’ve Put in my Mouth This Year award goes to the deep fried oyster in bacon cream. 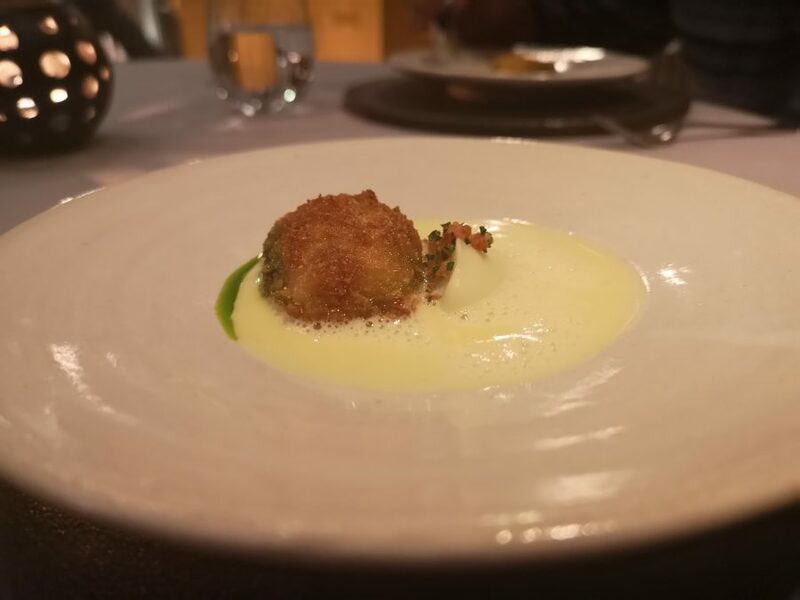 The plump breadcrumbed oyster alone is a thing of beauty but that cream, which tastes so much of crispy bacon, is astoundingly good. 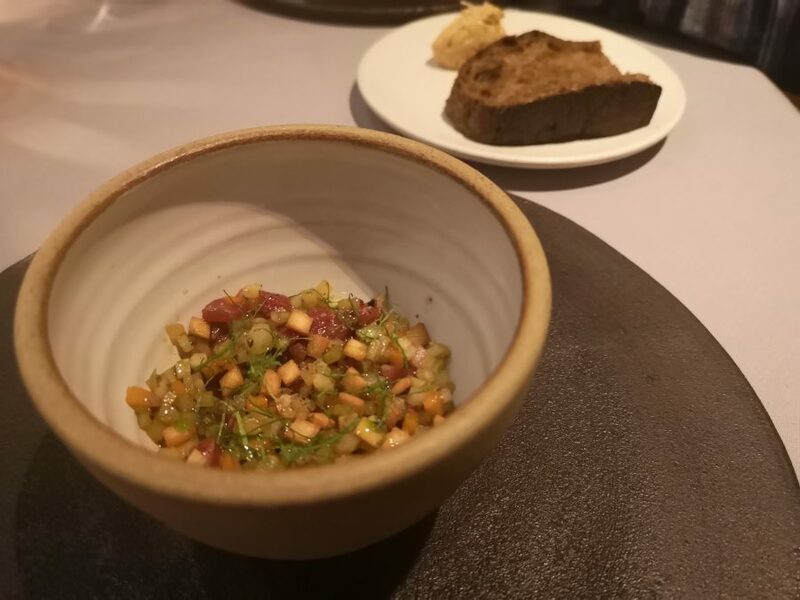 A slice of bread and butter, bought-in from a local baker using Adam’s recipe, comes with a bowl of beef tartare, “tater ash” and mushroom catsup (the original word for ketchup). 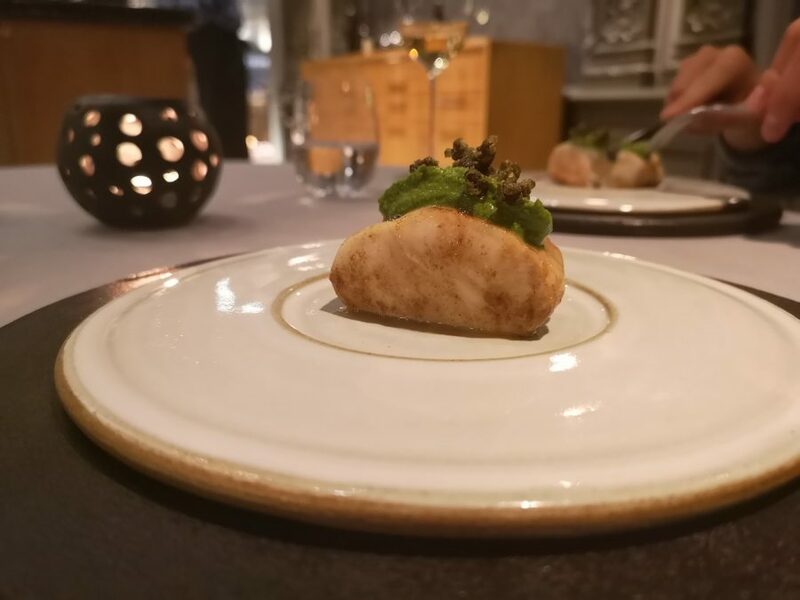 Hake baked in mushroom butter with green sauce displays the kitchen’s ability to keep things simple while maximising flavour. The salsa verde/pesto concoction is packed full of herby goodness yet it doesn’t overpower the delicate fish. 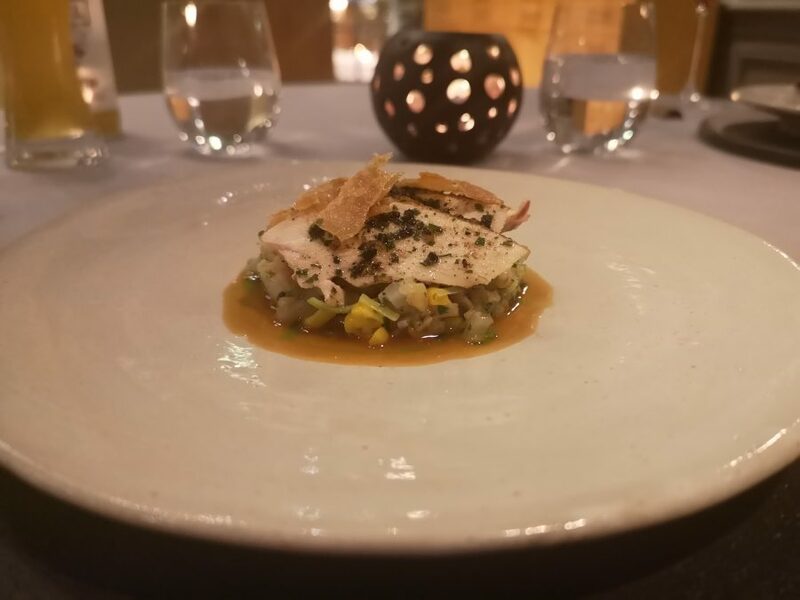 Organic Rhug Estate chicken with turnip, barley and corn is made more indulgent by shards of crispy chicken skin. The skin of a chicken being one of life’s great pleasures. 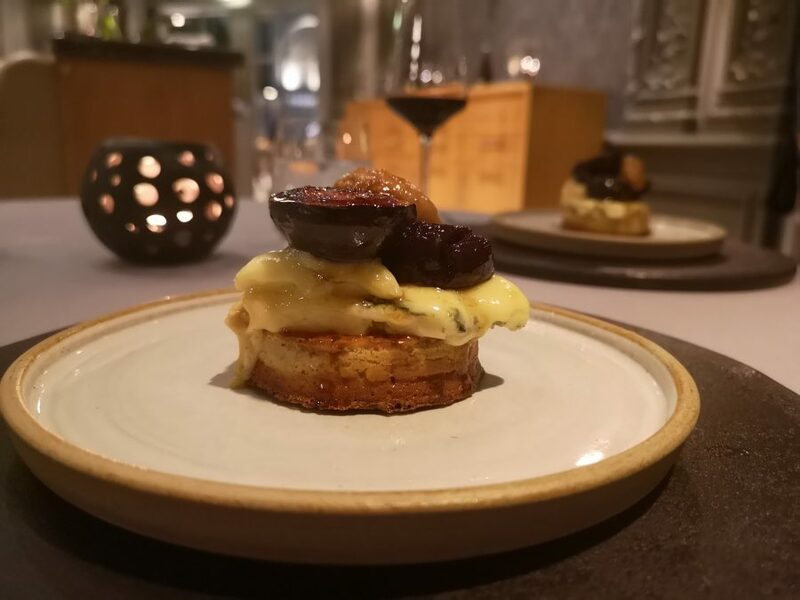 Cheese is a particular highlight as it’s Stichelton; LOVE, atop a homemade crumpet; DOUBLE LOVE. I’d take this over cheese and crackers any day. We enjoy desserts up at the counter which is lots of fun as you can chat to the chefs. 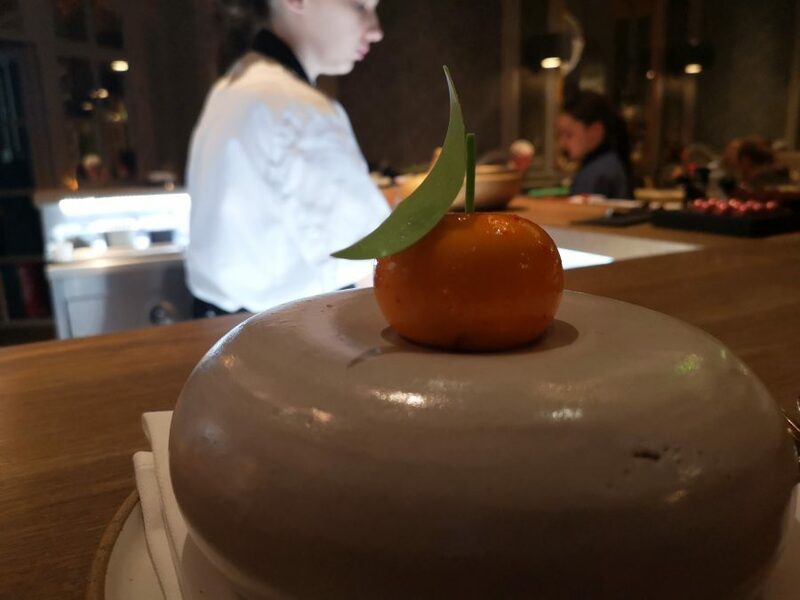 An ‘easy peeler’ orange is made from the most delicate sugarwork. The attached stalk and leaf are sweet white chocolate while the orange is filled with sharp sea buckthorn. The balance is perfect. 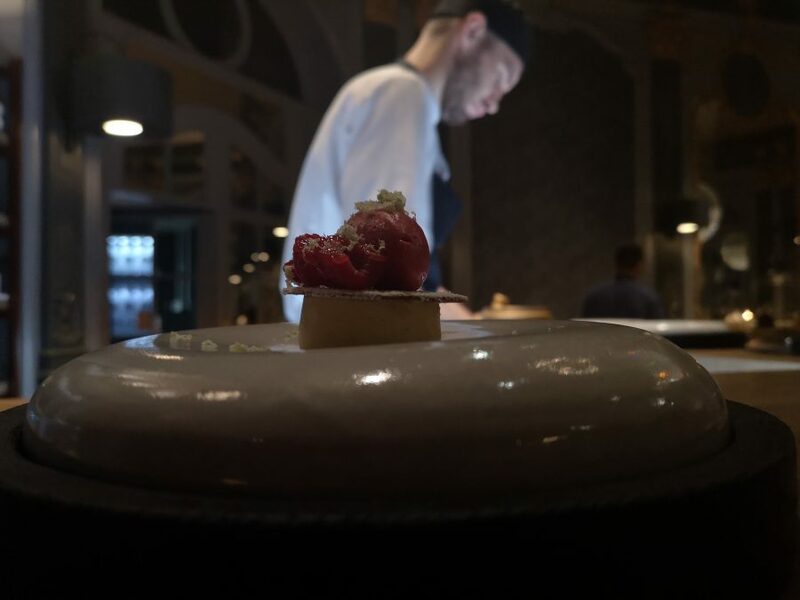 The final sweet treat is basically a posh cheesecake; baked cream cheese with raspberries (fresh and sorbet) and a little spherical biscuit. It’s the perfect end to such a well-balanced menu. The menu at Adam Reid at The French is like a Best Hits album where every track is an absolute banger. 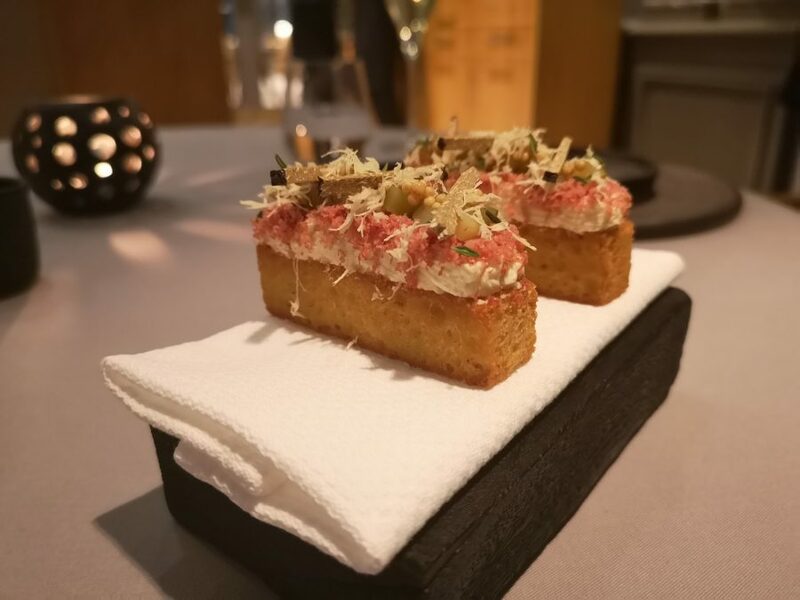 The food is driven by flavour which isn’t always the case these days with similar restaurants. 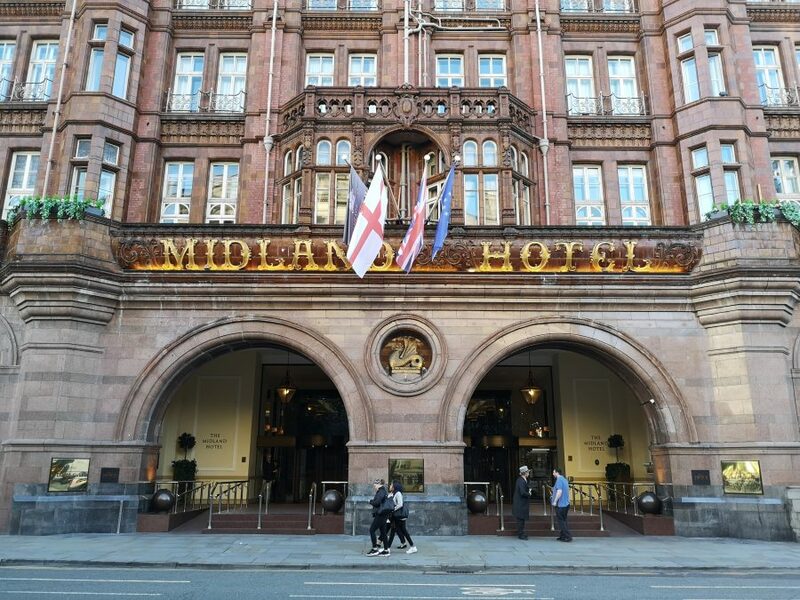 I just wish I lived in Manchester.